Cook spiral pasta until done. 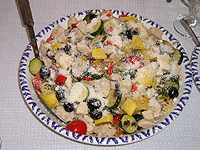 Saut in olive oil the 3 chopped chicken breast( boneless, skinless)chopped yellow squash,and zucchini. In another pan with melted butter saut chopped onions, green and red pepper and mushrooms toss together in the lager pan add white wine and chicken broth add in black olives and chopped tomatoes. Sprinkle with parmesan cheese and top over the Fussilli (Spiral Pasta).